1. HOW TO ENTER: No Purchase Necessary. To enter, contestants should either call EF Tours for Girl Scouts at 1-800-457-9023 and express interest in the contest, visit eftours.com/girlscouts or send in a postage-paid business reply card entry form. Required information includes the contestant's name, address and telephone. EF Tours for Girl Scouts can be contacted at EF Tours for Girl Scouts, Two Education Circle, Cambridge, MA 02141. One entry per person. 2. ELIGIBILTY: The contest is open to tours that are traveling internationally with EF Tours for Girl Scouts. 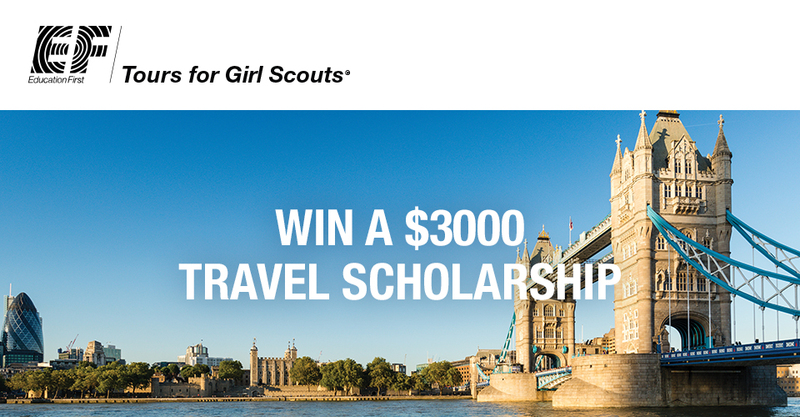 EF Tours for Girl Scout tours traveling within North America are not eligible for this contest. Employees (and their immediate families and household members) of EF and its affiliates are not eligible. 3. GRAND PRIZE: The prize includes a $3,000 scholarship fund to be applied to an EF Tours for Girls Scouts program. The $3,000 prize can be allocated among the travelers at the discretion of the Group Leader leading the tour. The scholarship prize can be applied to all program, membership and departure fees. The scholarship prize cannot be applied to any optional excursions fees, insurance fees, money for gratuities or discretionary on-tour expenses. 4. GRAND PRIZE DRAW: The winners will be selected in a random drawing after February 28, 2018. Participants agree to be bound by these rules and all decisions of the judges, whose decisions on all aspects of this drawing are final. The winner will be notified by April 1, 2018. The winner does not need to be present to win. EF Tours for Girl Scouts will notify the winner by phone, email or standard mail. EF Tours for Girl Scouts, its affiliates agents and others working for them or on their behalf, will have the right to photograph the winners and entry constitutes permission to use their names, pictures, likenesses, troop’s name and city and state of residence(s) in advertising for no additional compensation. 5. Starting dates and ending dates for receiving entries are January 2, 2018 and February 28, 2018, respectively. 6. Tour and travel dates are subject to availability. All travel must be completed by September 30, 2020. 8. DECLARING THE WINNER: Prize must be claimed by April 30, 2018. Failure to execute and return any requested document(s) within 14 days of receipt, or return of notification or prize as undeliverable may result in forfeiture of prize and an alternate potential winner being selected at the sole discretion of EF Tours for Girl Scouts management. Winners and all travelers must execute EF's Release and Agreement, Booking Conditions, etc. 9. EF Tours for Girl Scouts makes no warranties with respect to the prize. 10. The sweepstakes is void where prohibited or restricted by law and is subject to all Federal, State, and Local laws and regulations. All taxes on prizes are solely the responsibility of the winners. To learn the name of the winner, contact EF Tours for Girl Scouts after February 28, 2018. EF Tours for Girl Scouts is not responsible for any lost or misdirected entries. Prizes are non-transferable and may not be redeemed for a cash equivalent. The sweepstakes is eligible to residents of the United States and Puerto Rico only.